British star Victoria Beckham has revealed she never washes her jeans. The singer-turned-designer is a global fashion icon, but she's revealed that the only time she puts her jeans in the washing machine is when her children spill things down her. Victoria - who has sons Brooklyn, 18, Romeo, 15, and Cruz, 13, as well as six-year-old daughter Harper - told Elle magazine: "If the kids spill [something on them], then I have to wash them, obviously, but even then it's only on cold wash. And normally, no, I just don't wash them at all." This comes shortly after Victoria admitted that the challenge of raising her children and building her fashion business means she "never stops". But in spite of these stresses, the 43-year-old star - who is married to retired soccer player David Beckham - relishes her jam-packed schedule. Speaking amid speculation about reuniting with the Spice Girls, she shared: "Doing what I do with my own brand and trying to juggle four children and a husband is enough for me, I'm just trying to do the best I can. I'm trying to be the best professional, the best mum, the best wife." Victoria will showcase her AW18 collection at London Fashion week for the first time in September to celebrate 10 years in the business. And she recently promised that her runway show will be something special. She explained: "I need to think outside the box and do something different, I don't know whether it's going to be a one-off ... but September will be exciting." 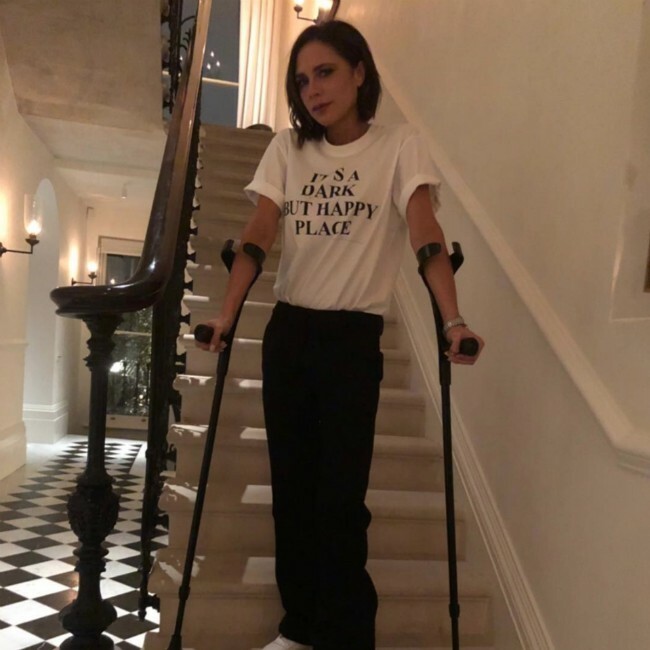 Victoria Beckham is suffering from a "small stress fracture", which means her foot is in a protective boot. The 43-year-old fashion mogul was spotted wearing a protective boot around her foot this week after seemingly suffering a mystery injury, and on Fridayshe took to Instagram to reveal she just needs to rest after being diagnosed with a stress fracture, which is a small crack in a bone, or severe bruising within a bone. Posting a picture of herself with her boot on and using crutches, Victoria wrote: "Thank you for all the lovely messages,a small stress fracture, just needs some rest! #itsnotideal (sic)"
Stress fractures are commonly caused by overuse and repetitive activity, and whilst Victoria - who has Brooklyn, 18, Romeo, 15, Cruz, 12, and Harper, six, with her husband David Beckham - didn't divulge how she came to suffer the injury, it's thought it could have occurred from the star's persistent use of high-heeled shoes. Her love for heels was echoed earlier this month when she expressed how "excited" she is to be able to wear kitten heels after she introduced a new pair of the pointed toe shoe at New York Fashion Week. She said: "I'm excited to wear these, I've done lots of complete flats and proper heels but I haven't done a kitten heel before." Victoria's injury means she needs to take some well deserved rest, which will likely mean stepping back from her hectic daily schedule for a little while. Describing her daily routine in September, she said: "I get up quite early, around 6am, and do an hour in the gym before the kids get up, then I give them breakfast and David or I take them to school. I'll then fit in another hour's workout before I go to the office. I'm very disciplined, I have to be. "It's really the only time in the day I get to myself. No one comes into the gym, no one follows me in there with a laptop. If I'm standing in the kitchen for too long, then laptops will come floating in my direction. Someone always wants something approved, something signed off. Other than the children no one dares come into the gym."